March 22, 2019 August 7, 2018 by Leslie M.G. If you love mushrooms and have always been fascinated by the way they grow, it’s time to take the next step and grow your own. 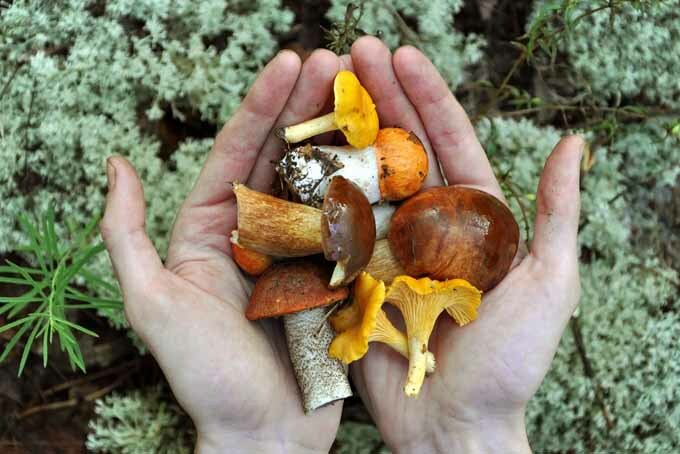 Foraging for mushrooms in the wild is fun, exciting, and also a wonderful way to incorporate a little exercise into your food-finding missions. 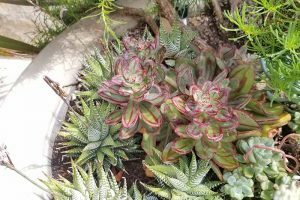 But sometimes you want to be able to pick them a little closer to home – like in your own backyard, or even in your living room. And especially for safety’s sake, it’s great to be able to know exactly what you’re getting in terms of variety, chemical exposure, and growing practices. 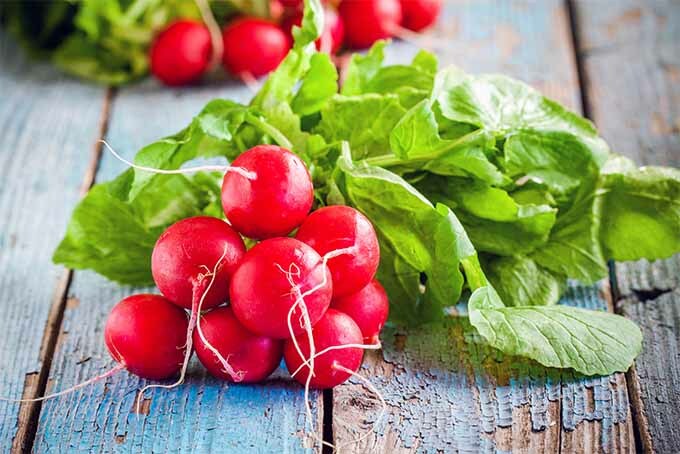 Visitors to your garden will be so impressed with your homegrown harvests! Ready to talk fungi? Let’s go! First, select the type of edible fungus that you’d like to grow. 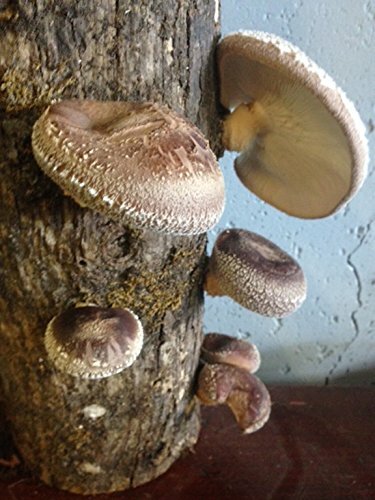 Many varieties are readily available in kit form, including shiitake, enoki, lion’s mane, and oyster mushrooms in a variety of colors. If you are a mushroom lover, chances are you have your favorites already in mind. But this is a great opportunity to branch out and try something new, as well. Some people love the delicate but pungent flavor of hedgehogs or black oysters, while others love the meatiness of morels or shiitakes. Now’s your chance to enjoy the amazing homegrown flavor and satisfaction of growing your own! For kits that are grown indoors, choose a location that is relatively warm with indirect sunlight, out of the reach of children and pets. 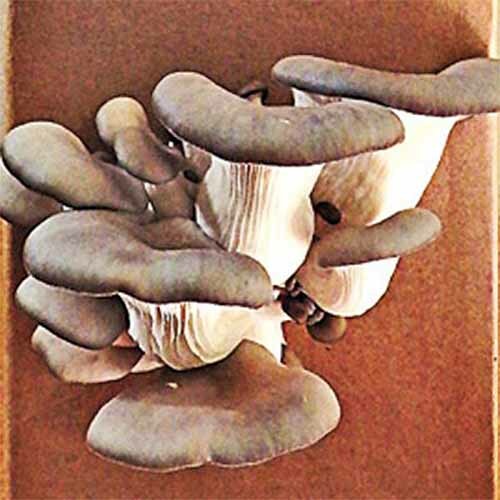 Ideal indoor temperatures for mushroom growth are typically between 65 and 70°F. Keep in mind that fungi will grow very slowly or may not spawn in locations that are consistently below 60°F, and specific moisture requirements depend on the species. Package instructions will indicate the needs of the varieties that you select. Whatever your preference, there is a growing kit out there for you. Let’s take a closer look to find out more. Some kits use the box that they come in for growing, and these will be pre-filled with a growing medium that has been seeded with spores. Others come with hand-cut logs that have pre-drilled holes which are filled with fungal spores, or mycelium, and then covered with cheese wax for protection from insects and other natural predators. Whichever you choose, they are both very easy to set up and maintain. 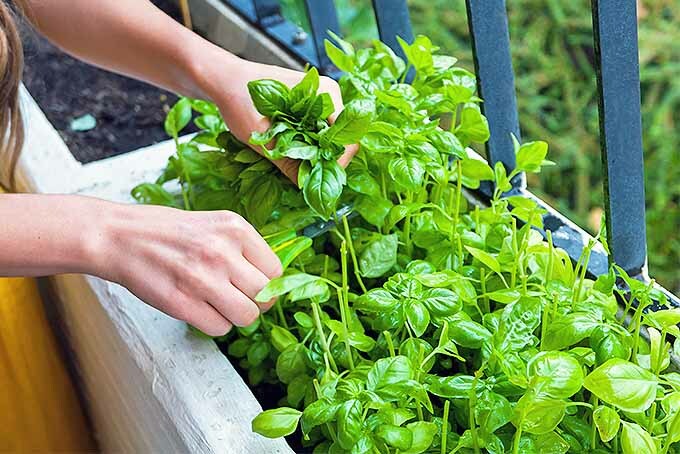 All you need to do is keep them moist and at a relatively consistent temperature during their growing cycle. Oh, and don’t forget the best part – harvest your beautiful crops every few weeks for the life of the kit. Enoki mushrooms (Flammulina velutipes), with their tiny caps and long, skinny stems, are excellent in soups and salads – and they’re easy to grow at home. 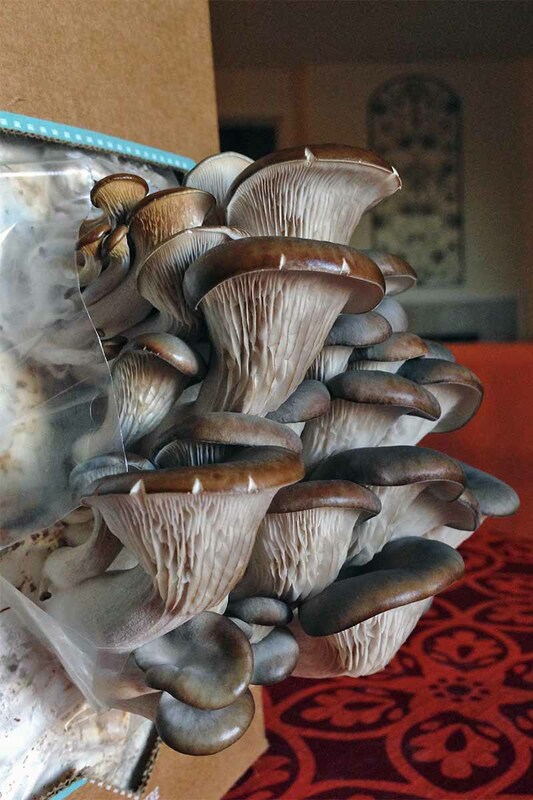 Pro-Gro kits from Mushroom Mojo are available via True Leaf Market. 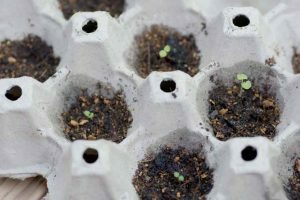 They include a sterilized sawdust block for growing that has already been inoculated with a strong commercial strain of enoki, a mister for watering, a humidity tent to help maintain the moisture of your crop, and detailed instructions. Suited to drier climates, each kit will produce about 2 pounds of enokis ready for harvest about once a month over the course of a season. Another wonderful variety with a playful, unique appearance that has been used for centuries in Chinese medicine, it is now favored as a delicious seafood-flavored addition to meals (some say its taste is reminiscent of lobster or crab). 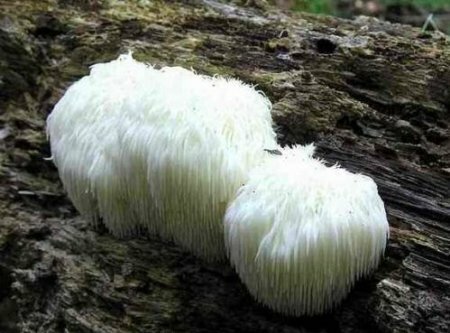 Lion’s mane (Hericium erinaceus) is an exciting type of edible fungus that you can grow at home, with clusters that can reach baseball size. Also known as satyr’s beard, bearded tooth, hedgehog, or pom-pom mushrooms, this is not your standard button type. 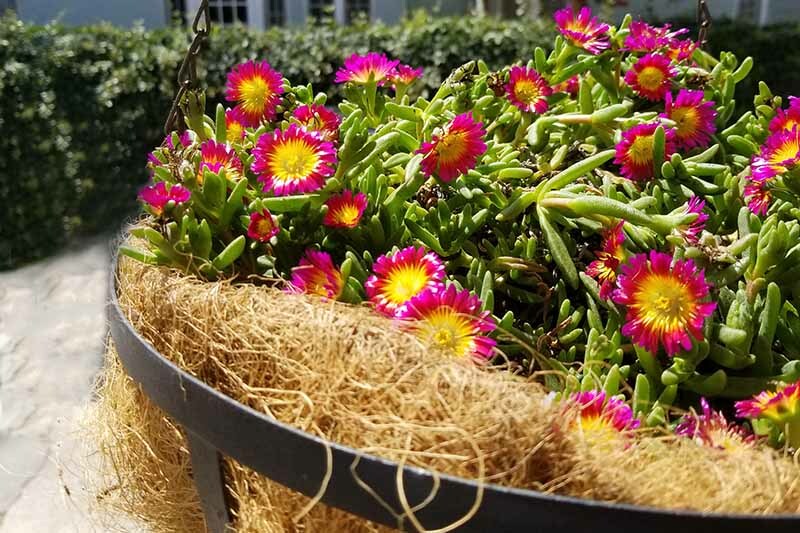 Not only does its flowing, icicle-like appearance attract the eye, it is also a very easy variety to propagate and maintain, and it’s rich in protein to boot. Gallboys, a well known fungal spore retailer, offers an easy to use growing kit that comes complete with a wood chip growing medium, a bag of inoculated mycelium, a humidity tent to lock in moisture, and a comprehensive instruction booklet. All you need to do is keep the growing medium moist. Within 2 weeks’ time, you will see gorgeous results, and your lion’s mane will be ready to harvest in 30-45 days. 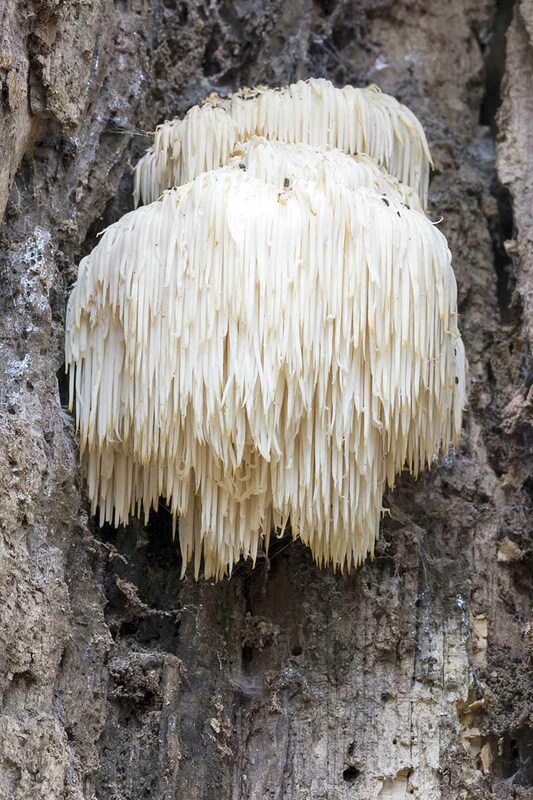 Lion’s mane is known to reseed itself easily and often, dropping spores from its long tendrils regularly. If kept moist as directed, this kit may fruit three or more times without a problem. 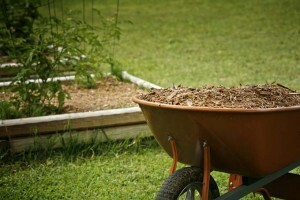 After that, you may try swapping the growing medium for something else, like a log or more wood chips. If you do that, chances are you will be able to keep your lion’s mane growing indefinitely! Kits are available from Gallboys via Amazon. These include growing substrate with hardy spores, a humidity tent, and instructions. Another option is to purchase a Mojo Pro kit from Mushroom Mojo direct via True Leaf Market. They claim its sweet flavor is a great alternative for the fungi haters out there, and kids will love their shaggy appearance. This kit includes a sterilized sawdust block that serves as the growing medium and that has already been colonized with lion’s mane spores, a humidity tent, a mister for watering, and growing instructions. It will produce about 1.5 pounds of bearded tooth for monthly harvests. 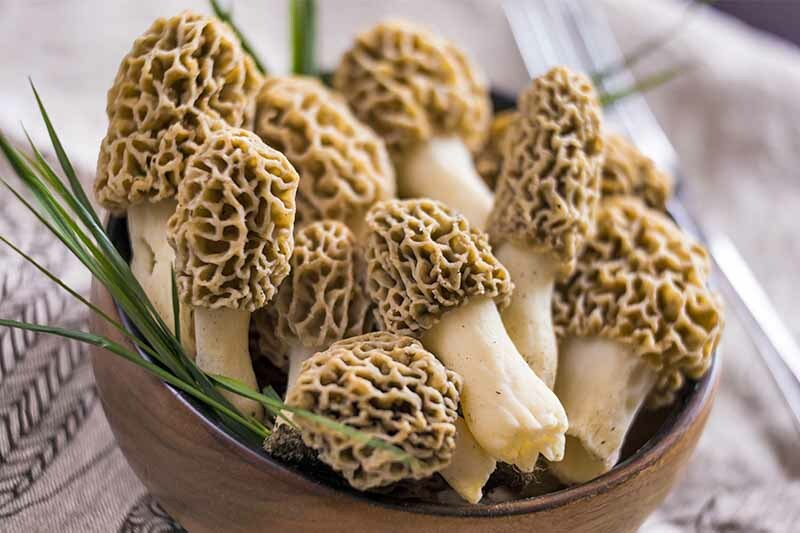 Not only are they beautiful to behold, with their pine cone shaped appearance that is reminiscent of a fairy house or some other magical place, morels make a delicious addition to so many recipes. 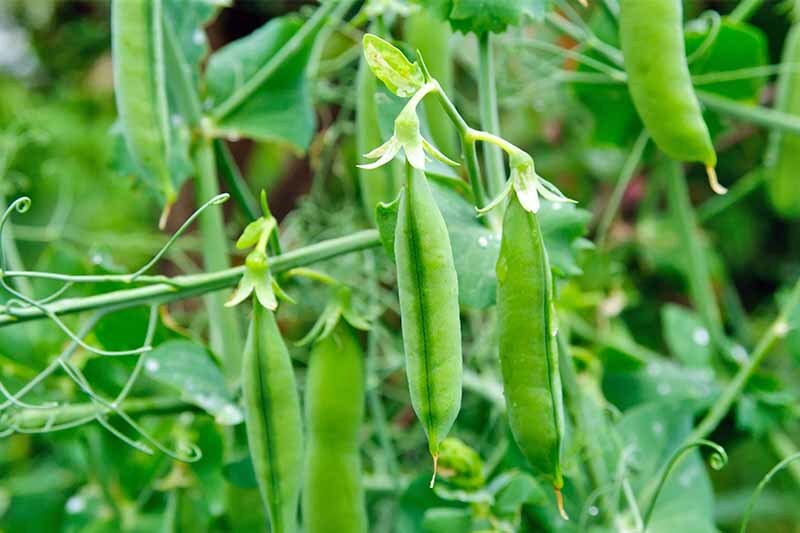 When picked at a young age, they are tender and can be cooked whole, stem and all. As they get larger and older, only the caps should be used, as the stems do get a bit woody over time. Their flavor is hard to describe, but it does have a nutty and earthy taste and a meaty texture, which may easily replace animal protein in meals. And don’t forget that dehydrating is a great option for mushrooms if you procure a large harvest! 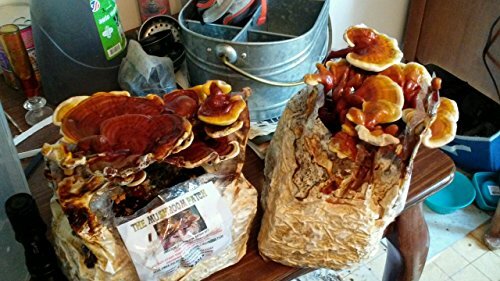 GMHP Gourmet Mushroom Products offers a wonderful kit that comes with everything you need to grow this delicious and abundant variety, and it’s available via Amazon. The Morel Habitat Kit is meant for outdoor use, and it is designed to be grown directly in your soil – all you need is about four to five square feet of ground. 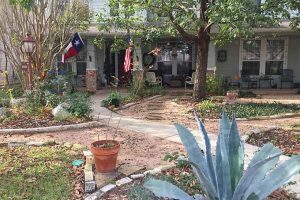 If it’s located in an area that you can keep moist as directed, a small raised bed would be perfect for this. 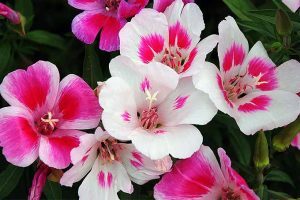 This kit is wonderful because, unlike most of the others, it is meant to be grown as a perennial crop, and will continue to produce year after year if the appropriate conditions are provided. 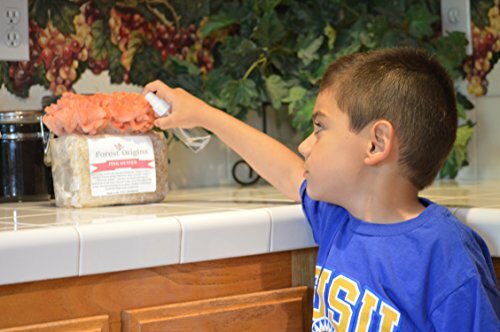 It includes a bag of hearty inoculated mushroom spawn, and a complete set of growing instructions. All you have to do is follow the directions, planting the spores in the soil as directed, and wait. Keep in mind that patience is key here – morels generally take about a year to establish themselves and colonize the soil. 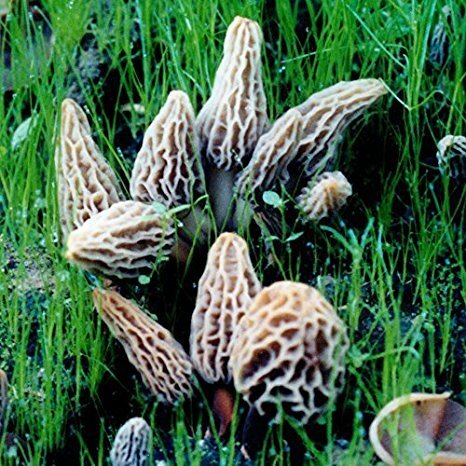 After the first year, you can expect to yield pounds and pounds of delicious morels. 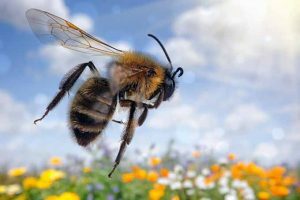 And they will return year after year, as these will reseed themselves annually. 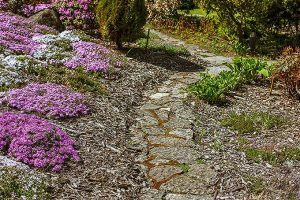 Because spores are planted directly into the soil, as long as you have the space available and the appropriate growing conditions are provided, your morel patch will quickly become a beautiful and productive part of the garden that you can enjoy for years to come. 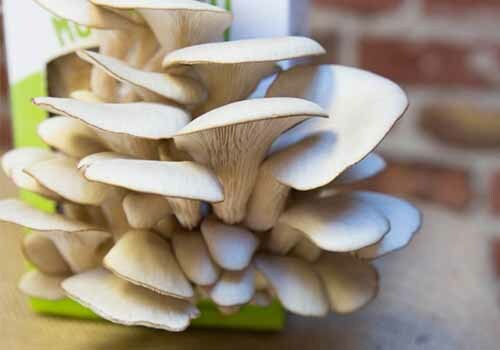 By far the most popular type available to grow from a convenient kit, oyster mushrooms are popular in Asian cuisine, and a huge variety of colors are available, with some associated variation in flavor and texture as well. Black oysters have a bold flavor, especially in comparison to the white variety, and the flavor and color can be intensified even more if they’re exposed to a little sun as they grow. High yielding kits that will produce multiple harvests are available from Direct Gardening. And if you’re less than successful, you can reach out to the company for a replacement kit any time within one year of purchase. 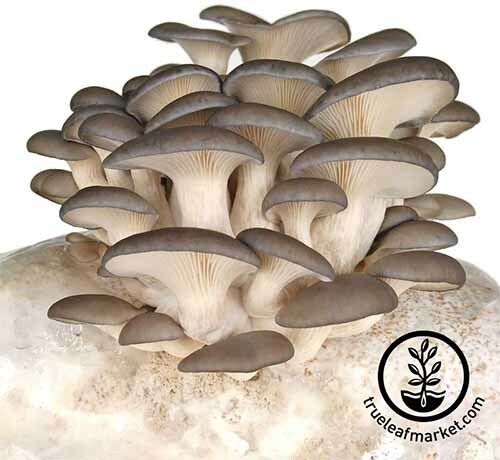 The gray oyster (Pleurotus oystreatus) is another popular variety, and kits to grow these at home are available from True Leaf Market. 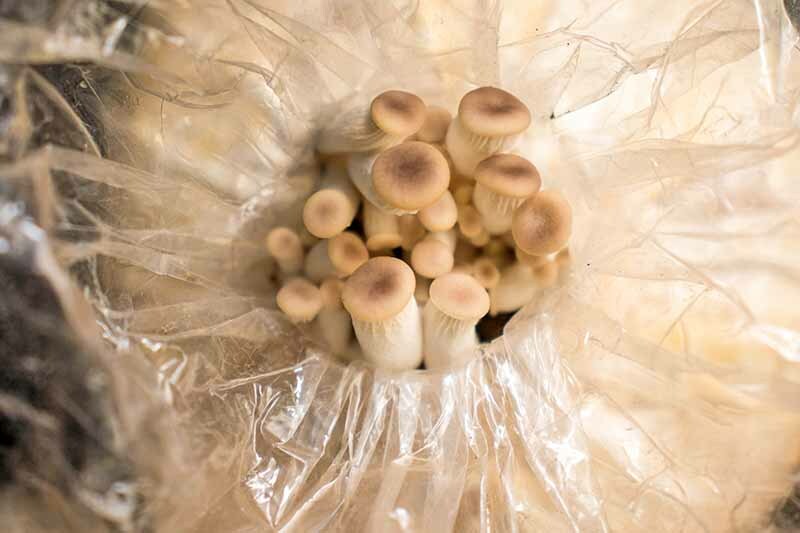 Each Pro-Gro kit from Mushroom Mojo includes a pre-inoculated sawdust growing substrate, mister bottle, humidity tent, and growing instructions. 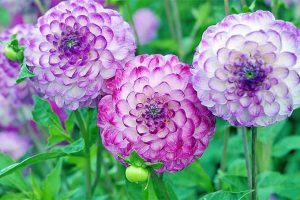 Fresh air and high humidity are required to grow this type successfully, and attempted growth in dry climates is not recommended. 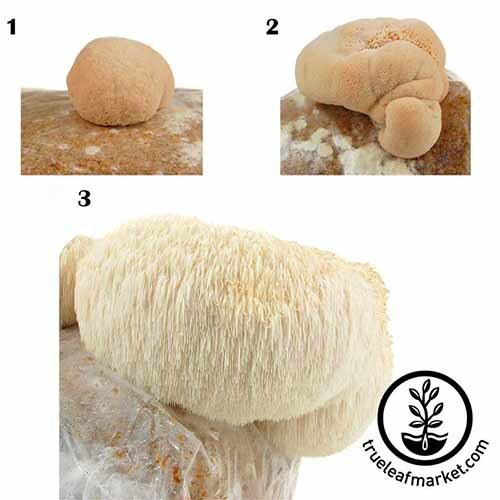 This beautiful and lush mushroom type has a velvety texture, and mild flavor. If pearl oysters are more your thing, you’re in luck! Back to the Roots offers an organic kit that grows right out of its cardboard packaging. Simply open up the box, spray with water, and watch as your edible fungus grows and is ready to harvest in just ten days! 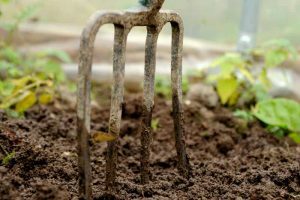 The package includes soil as a growing medium, pearl oyster fungal spawn that’s ready to be mixed into the soil, and a mister for simple watering. 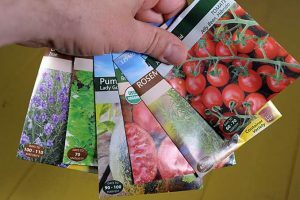 It even includes a package of organic tomato seeds to plant in your kit once it is finished growing and you are ready to compost it. A crop of 1-2 servings from each of two harvests will provide you with delectable oyster mushrooms to enjoy. 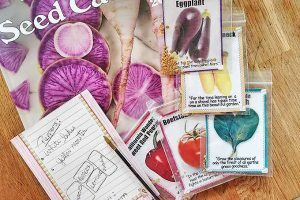 First and second crops are guaranteed, and many home growers have had success getting third, fourth, or even fifth harvests with this kit. 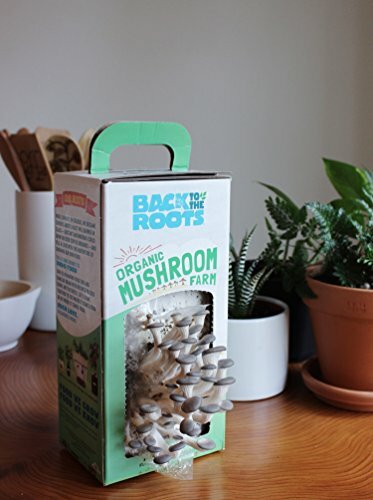 The Back to the Roots Organic Mushroom Farm is available on Amazon. A mini farm is also available, and it will grow a yield of about 1-2 servings. This smaller kit does not include the bonus cherry tomato seeds. You can find the miniature version via Amazon or ACE Hardware. Plus, if your spores don’t produce successfully, you can get in touch with Back to the Roots for a full replacement kit. For an exotic appearance with a gorgeous hue, the pink oyster variety (Pleurotus djamor) is another fun option. Organic pink oyster growing kits are available from Forest Origins via Amazon. They come with everything you’ll need to grow your own crops indoors, including instructions and a convenient misting bottle. Forest Origins offers a 100% satisfaction guarantee – if your mushrooms fail to grow, just get in touch for a full refund. 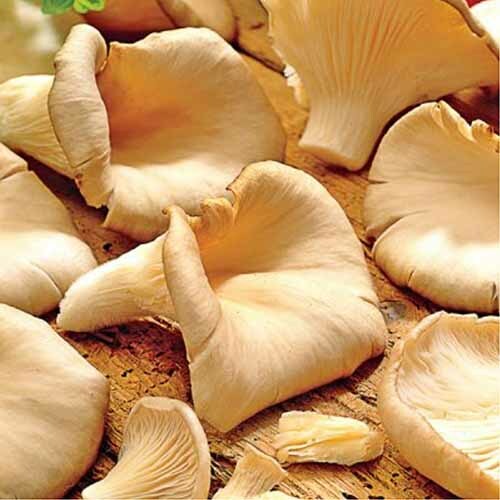 White oyster mushrooms produce large yields, and they have a pale color and mild flavor. 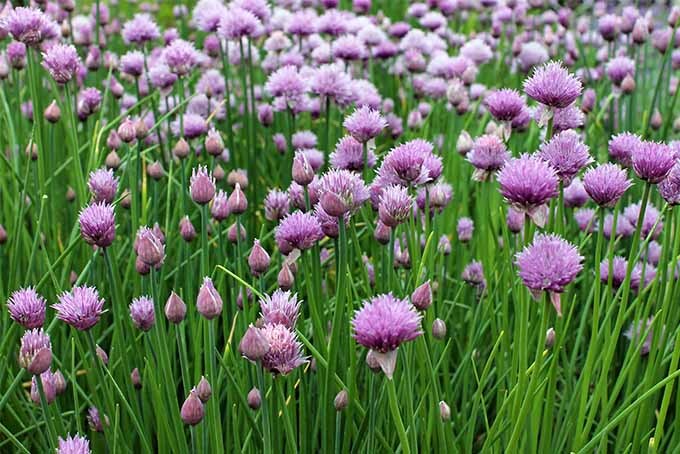 A favorite in Asian cuisine, kits that will produce multiple harvests are available from Direct Gardening. 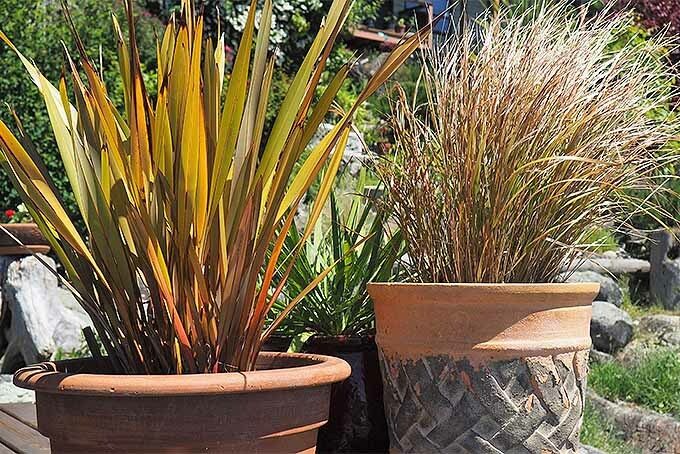 Free replacements are available within one year of receipt of products from Direct Gardening if they do not live, with return of the original shipping label and a written request. More into the yellow variety? 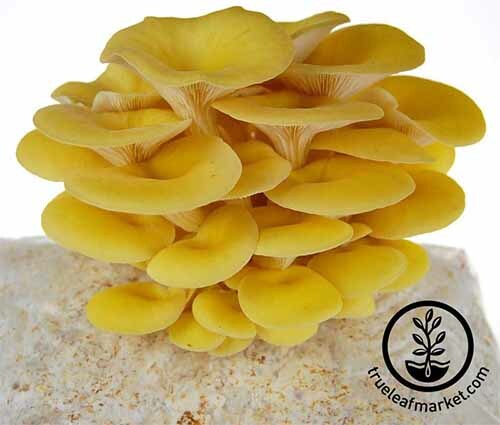 These vibrant mushrooms (Pleurotus citrinopileatus) have a brightly colored hue that makes a great accent or focal point in your indoor garden space – you can’t miss it! 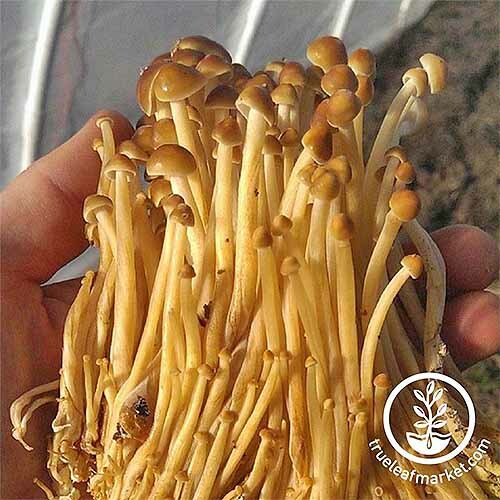 A Pro-Gro kit from Mushroom Mojo is available via True Leaf Market. It includes everything you’ll need – a sterilized sawdust block that’s inoculated with a strong strain of mycelium that’s ready to grow, a spray bottle, humidity tent, and full instructions. With this kit, you can expect to produce about 2 pounds of yellow oyster fungi ready for harvest over the course of 2-3 months. 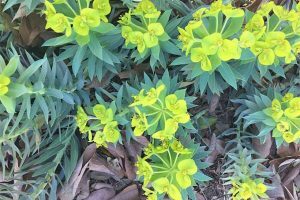 Keep in mind that this variety is not recommended for growth in dry climates, since it needs significant moisture to thrive. 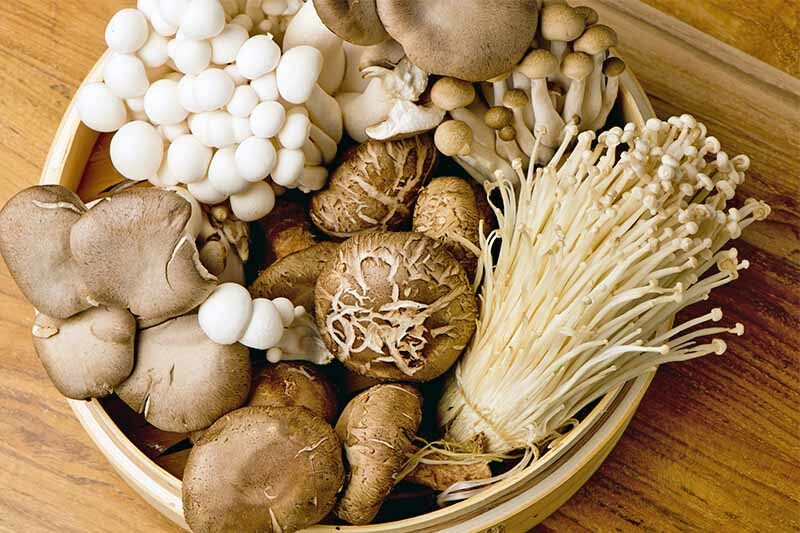 Known for its medicinal properties related to immune health, this mushroom type has gained a lot of notoriety in recent years, and it is frequently consumed as a nutritional supplement. Though we can’t vouch for these claims (do your research!) this type has been used historically in Japanese and Chinese traditional medicine, and its popularity when consumed as a tea or powdered supplement continues to this day. The red and brown fungus has a strong, distinctive flavor. Growing kits from Gallboys are available via Amazon. 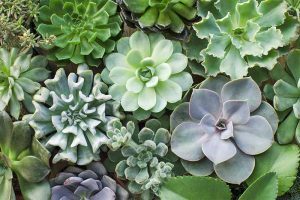 These are perfect for indoor growing, but they can be used outdoors as well, given the right conditions. Instructions, a humidity tent, and growing substrate with spores are included. You’ll need to provide your own mister bottle for watering. 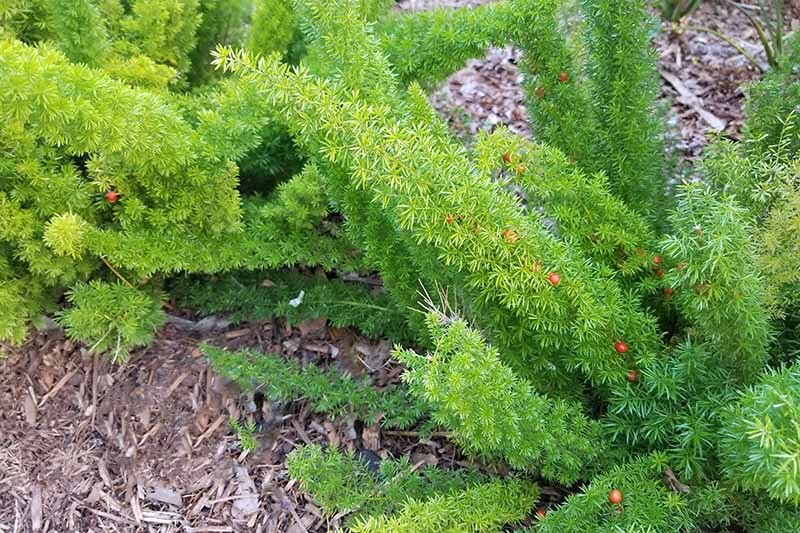 If you want to grow this earthy and rich variety, 2funguys offers pre-inoculated 12-inch logs that are ready to grow. Hand-cut logs ranging from 3-6 inches in diameter and about 4-7 pounds in total weight are pre-drilled, filled with spores, and sealed with cheese wax so they’re ready to go – all you need to do is select a shady location in your yard, place your log either on its side or upright, and follow the included instructions for watering. With high yields, this type is recommended for first-time outdoor growers. And if a rest period is allowed between each fruiting period, you can expect multiple harvests. This kit is available online via Amazon. If for some reason you are not completely satisfied with this kit, 2funguys offers a full refund or replacement. 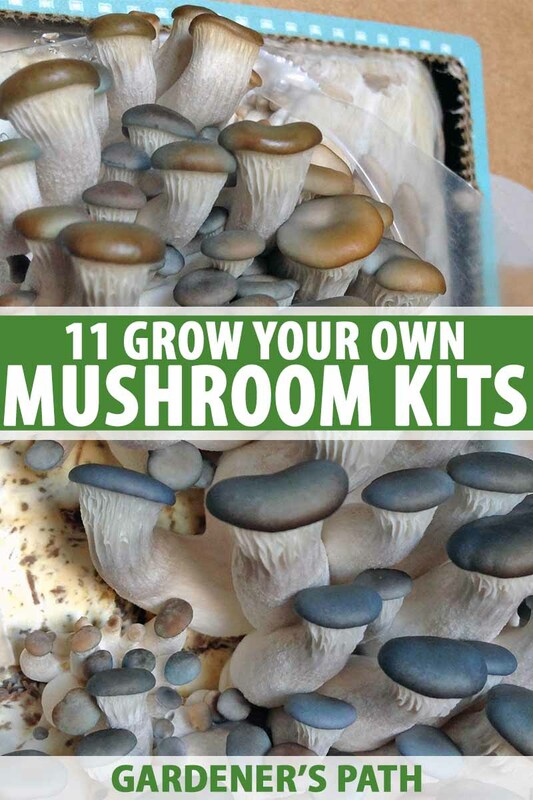 Mushroom growing kits are wonderful because you can cultivate smaller amounts in a controlled environment, and choose your favorites as you go. 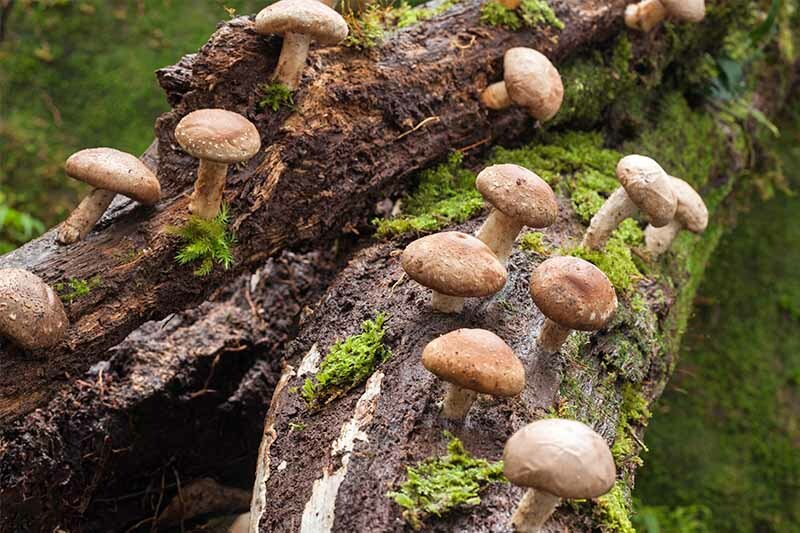 It’s also good to know that, if you want to keep one of your kits growing, as long as the mycelium is viable, all you need to do is provide the spores with another suitable growing medium, such as a newly fallen log or wood chips. All in all, there is no end to the lifespan of each kit, if you just give it what it needs to survive. 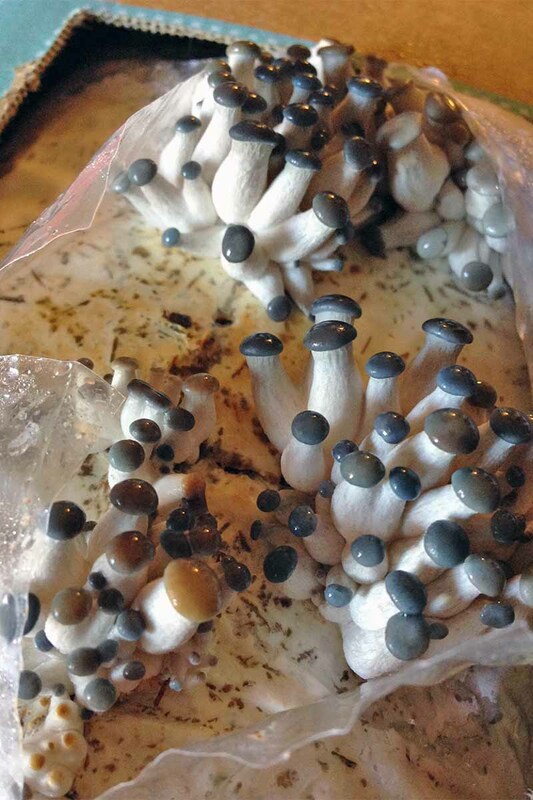 Nothing could be better than harvesting your favorite variety of edible fungus fresh, minutes before dinner is served. That flavor will linger on your tongue and in your mind long after your meal is over. Chances are, your guests will praise you for your knowledge of edible mushrooms… and then they will thank you for an incredibly delicious meal! Enjoy selecting and growing the perfect kit. And when you do, let us know all about it in the comment section below. We love to hear from you. Product photos via Gallboys, True Leaf Market, Mushroom Mojo, GMHP Morel Mushroom Products, Direct Gardening, Back to the Roots, ACE Hardware, Forest Origins, and 2funguys. Uncredited photos: Shutterstock. With additional writing and editing by Allison Sidhu. Leslie M.G. is a lifelong lover of all things natural. She lives in rural southern Vermont with her wife, two dogs named Charlie and Ruby, and one sneaky little cat named Max. 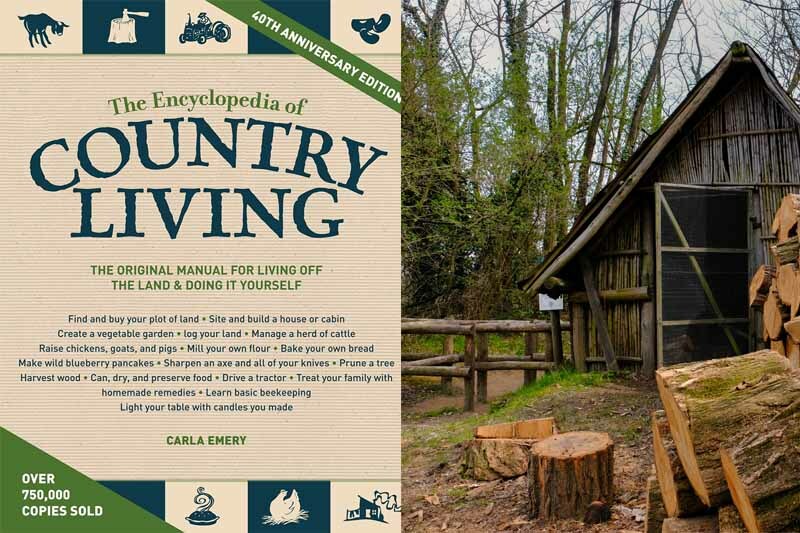 She is a grower, a farmer, a forager, and a writer who loves to combine all of these things to eke out a life in her little corner of the world. 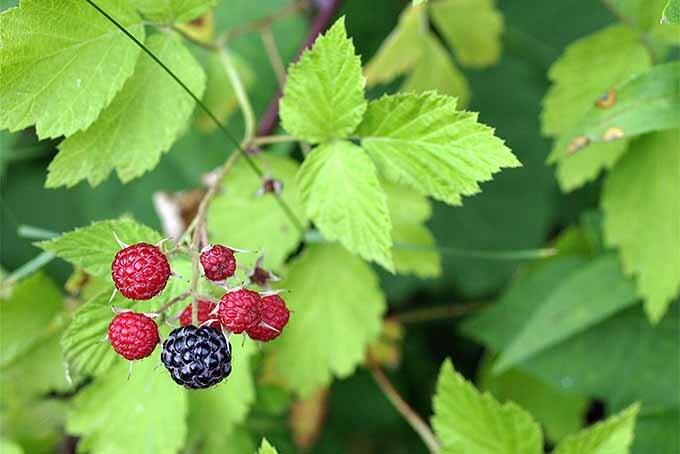 When the growing season comes to New England, her favorite thing to do is put on her overalls and head out to the garden, where she can plunge her hands into the rocky and fertile Vermont soil and get dirty. Her second-favorite thing to do? Pluck juicy ripe tomatoes from the vine and gobble them up, one by one. Love your site. Want to grow my own mushrooms so bad. Thank you for taking the time to write this clear, concise and informative page on mushroom kits. I appreciate it very much! Happy gardening to you, when the weather finally arrives for this most pleasurable engagement. The light, the geese and other birds presently flying overhead say it is just around the corner. Yay!